Starting center Khaled Holmes will sit out the Carolina game. 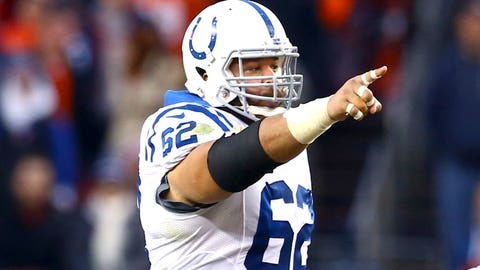 INDIANAPOLIS — Colts center Khaled Holmes has been ruled out for Monday night’s showdown with the undefeated Panthers. Holmes didn’t return in the second half of last Sunday’s game against the Saints after sustaining a minor neck injury in the second quarter. Holmes didn’t practice all week. Jonotthan Harrison entered the game for Holmes during the second half last Sunday. Harrison took reps at center with the first team all week at practice and likely will be the starter Monday night. "This is the NFL. The next person has to be ready. Coach always says prepare as a starter, you never know when your number will be called," Harrison said. "Come game day, if my number is called, I know I’m prepared."